--Mr. February, running back Jahvid Best, was concussed so severely in 2011 that he's unlikely to ever play football again. --Wide Receiver Nate Burleson (March) is still rehabbing a broken leg and is in danger of being released unless he agrees to take a pay cut. --Longtime kicker Jason Hanson (Mr. May) is about 97 years old and is contemplating retirement. --Mr. July, also known as defensive back Aaron Berry, was released before the 2012 season after a pair of offseason arrests. --In addition to being thoroughly mediocre, safety Amari Spievey (August) is an unrestricted free agent who seems unlikely to return to Detroit. --Defensive end Kyle Vanden Bosch (November) was released after a disappointing 3.5 sack season. But the real problem is the calender's cover. Here, at least, the Lions had the option of going with Matt Stafford or Calvin Johnson, players who have earned universal respect and acclaim in NFL circles. 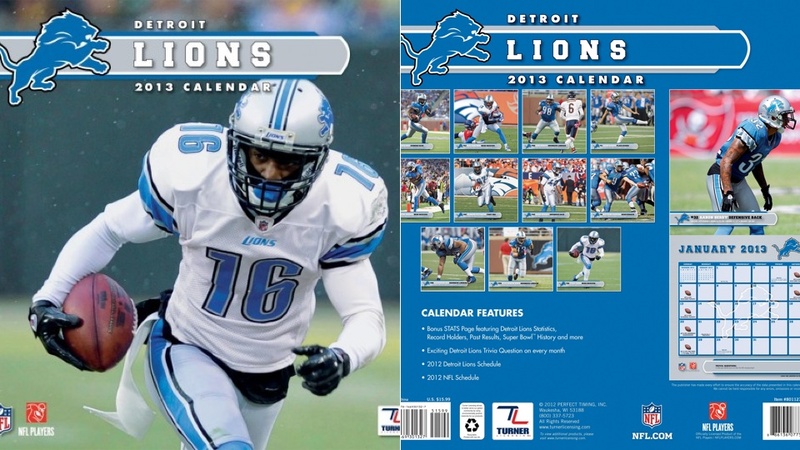 Instead, the team's supplier made the irrational decision to go with former Lions receiver Titus Young as its front man. We emphasize "former" because Titus Young spent the 2012 season putting on a very public clinic on "how to be an awful teammate," culminating in his release earlier this month. Look on the bright side, Lions fans---at least they aren't screwing up on the field yet. Give them until at least September.